RAIN or Shine hopes import Richard Kadeem Jackson will finally address something has been lacking in the team’s roster all these years – an intimidating, defending big man. Coach Yeng Guiao gave the 6-foot-9 Jackson the thumbs up as the Elasto Painters’ import in the coming PBA Commissioner’s Cup, precisely for his ability to defend the post. The wide-bodied Jackson beat out former Los Angeles Lakers’ Devin Ebanks, Nigerian Kenny Adeleke, and Marquise Grey for the job. Team manager Boy Lapid bared that Jackson's defensive skills indeed, were the swing factors in the franchise’s decision to plane him in on Tuesday morning. “Kailangan kasi namin ng big man na dumedepensa. Yun ang kulang sa amin,” said Lapid. Guiao ordered his coaching staff to facilitate the acquisition of Jackson after original choice Wayne Chism failed to get a release from his team in Israel. "Yan ang kailangan natin. Di na natin kailangan ng big man na umo-opensa pa. Kailangan natin dedepensa. Marami na tayong scorers," Guiao told his staff while watching the videos of the other import prospects. 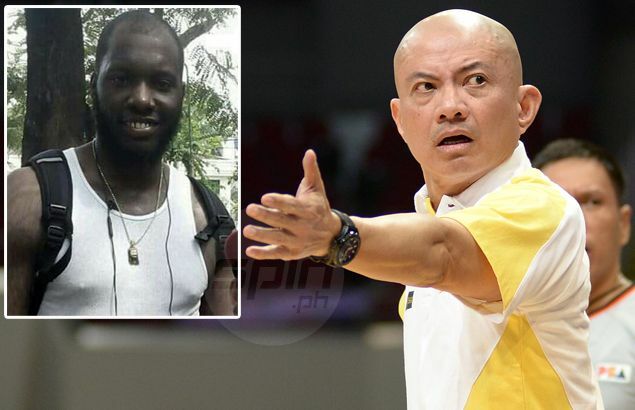 Lapid disclosed Guiao turned down suggestions for Rain or Shine to get the services of Ebanks, who was a former back-up forward of the Lakers. "Okay sana yun kaso ayaw ni coach. Masyadong wingman. Marami na raw kami. Slot position kasi ang gustong i-address ni coach Yeng," explained the longtime Rain or Shine manager. Adeleke was already close to being signed by the Elasto Painters, but like Chism, the Nigerian bruiser had trouble getting a clearance from his team in Uruguay. "Hinanapan namin ng clearance kaso walang Philippine embassy sa Uruguay. Balak niya sana na magpunta sa New York para makakuha ng papel, kaso sabi ko matatagalan. Malapit na opening," said Lapid. Grey, according to Lapid, did impress the coaching staff after he took part in the team’s practice drills at the NorthEast Greenhills gym a few hours after his 4 a.m. arrival. Rain or Shine bruising forward JR Quinahan sees a lot of promise in Jackson, who played a bit sluggish following a 16-hour trip. "Medyo mabigat kabanggaan. Hindi ko pa masyado nakita laro niya kasi hindi siya binabad kanina, may jetlag pa eh," said Quinahan. "Pero maganda 'yan. Kung talagang malakas sa ilalim, pwede na kaming mag-adjust ni Beau (Belga). Dati kasi pwersado kami makipagbanggaan sa paint," added the Cebuano cager. The lack of a dependable big man at the post cost the Elasto Painters dearly in two losses to San Mig Coffee in the Finals last season. The franchise co-owned by Raymund Yu and Terry Que has failed to win a championship in its last five finals appearance since 2013. "Wala. Kulang talaga kami sa big man. Yun na lang ang kulang sa team namin. Sana mapunan nung import na to," said Rain or Shine gung-ho guard Ryan Arana. "Sa wing at backcourt, solid na kami eh," he added.